From time to time one reads in one of the national news magazines or sees on one of the cable TV channels some (reputed) scripture scholar who questions the traditional understanding of the nature of Jesus, and the truth of His resurrection. These articles and programs are especially common at this time of year. Each year at Easter we proclaim who Jesus is: the son of God and the son of Mary, who suffered, died, and truly - bodily - rose from the dead. The Gospel from today’s Mass records for us another instance where Jesus appears to His disciples. He invites them to touch Him to see that He is not a ghost. And then He ate with them to give them further proof. I can’t imagine what kind of faith those “doubting scholars” would expect us to have if we accepted what they propose. I propose we stick with the creed that we recite each Sunday at Mass. Our Faith is not made up of fanciful notions, myths, or legends. It is real, true, and historical. We typically celebrate many sacraments in the Easter season, especially the three Sacraments of Initiation: Baptism, Confirmation, and Holy Communion. At the Easter Vigil we welcomed Jason Michael Mott into the Church. We have several baptisms scheduled in the upcoming weeks. And our young children will be making their First Holy Communion on May 6. Next Sunday (April 22) we will host the Deanery Confirmation Mass at Noon (consequently our 10am Mass will be moved back to 9:30am). 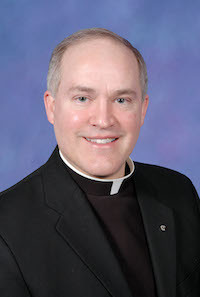 Please pray for the young people of our Deanery, that, having been “sealed with the Gift of the Holy Spirit” at the hands of Bishop William Patrick Callahan, they may be strengthened to live a full, conscious, and active life as true sons and daughters of the Father, and fervent disciples of our Savior, Jesus Christ!